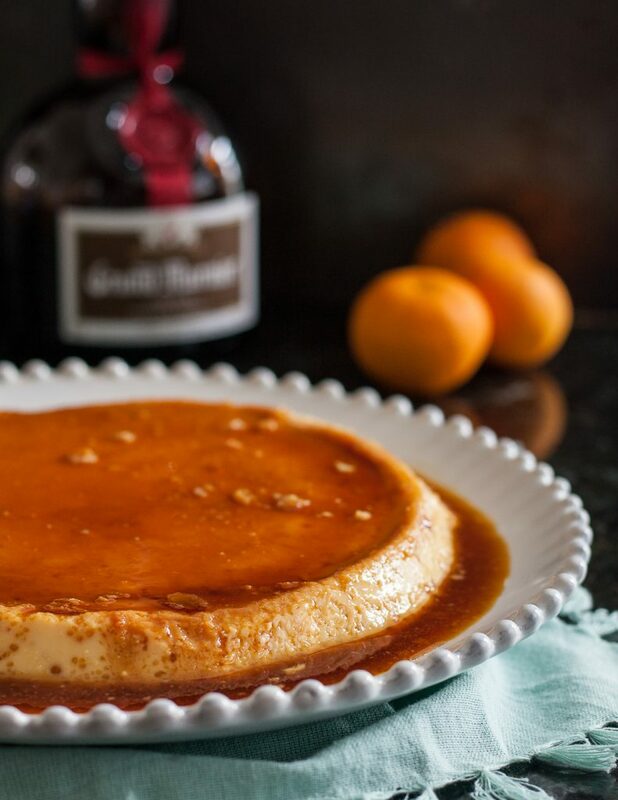 Classic flan gets a citrus liquor twist in this Grand Marnier flan recipe. 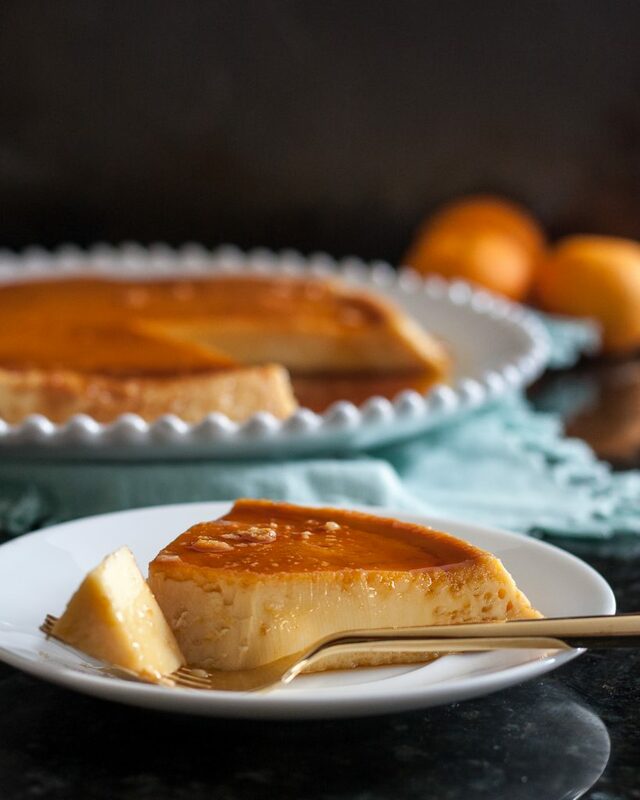 Flan is a delicious, cooling, custard dessert common in Latin cuisine. Here’s a fun fact I learned recently – flan has Roman roots! Apparently, a savory version was introduced to Europe by the Romans, and the rest is history. Who knew? Anyway, I thought this was a fun little bit of food etymology perfect for sharing to start the post so we can all say we learned something new. 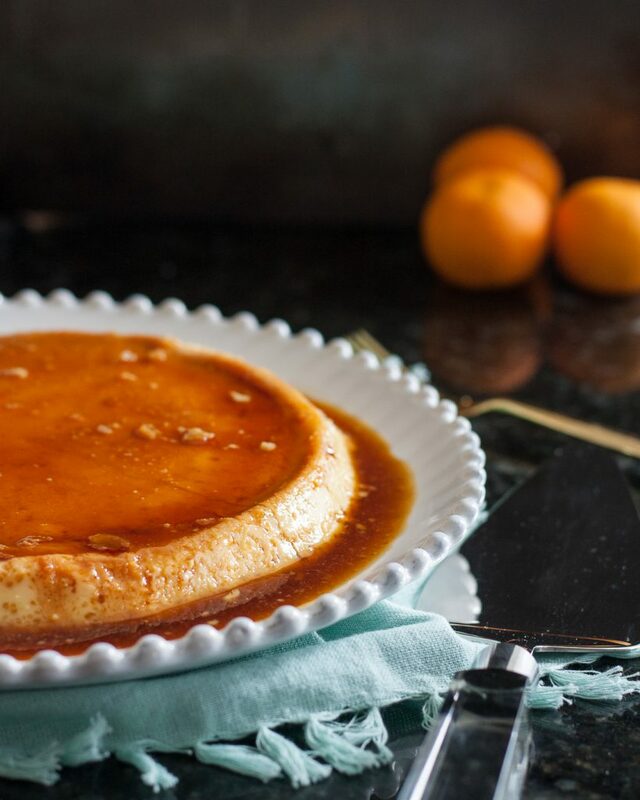 Nowadays when most people think of flan, it’s in conjunction with Latin American cuisine, and it’s almost always sweet. Whatever the origin, flan is one of my favorite desserts. I like the cool yet firm texture of the custard, and it’s such a fabulous make-ahead dish. 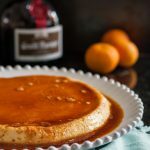 This Grand Marnier flan was actually my birthday “cake” this year, and I couldn’t let 2016 leave us without sharing the recipe. The basic flan recipe is very simple – eggs, sugar, condensed milk, flavoring – custard dessert recipes are very minimal on ingredients. That being said, part of the reason why I love flan so much is that it allows really high quality flavor ingredients to shine through. You don’t even need a lot, just a little is perfect. 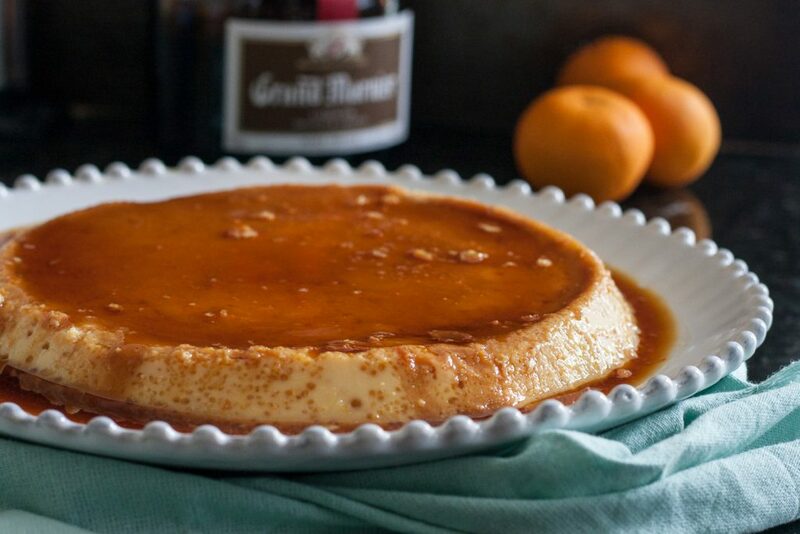 The Godfather and I are partial to using liquors and fresh fruit flavors (mostly citrus) in flan as those flavors were most popular in the flans we enjoyed as children. 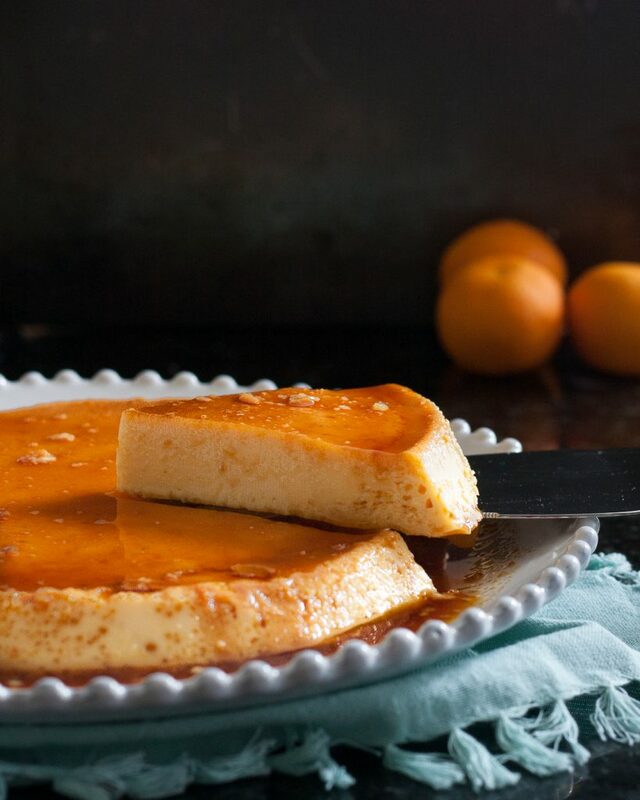 In my opinion, a good flan not only has good flavor, but the right texture. I get so upset when we purchase flan outside our home and it comes with that nasty “pudding skin” that forms over custard desserts that are baked too long or not stored properly. This recipe doesn’t do that as long as you don’t rush the baking process. In fact, this recipe is only a slight modification of Emeril’s Kahlua Flan recipe. This has been my base recipe for almost 10 years and it always turns out beautifully no matter how I adjust for different flavors. Adjust the recipe to bake in individual ramekins or bake in a large pie dish as I did for a lovely centerpiece dessert. Enjoy, darlings! Place the sugar and the water in a small saucepan and cook over medium low heat until the sugar starts to melt. Swirl the pan occasionally to promote even melting. Watch the sugar until it starts to caramelize and the minute it turns a golden brown, then immediately remove from the heat and pour into a 9-inch pie dish and swirl to coat evenly. If using smaller ramekins, divide evenly between the ramekins and swirl to coat. Set aside to harden. In a large mixing bowl, or the bowl of a stand mixer fitted with the whisk attachment, whisk the eggs 2-3 minutes until light and pale yellow. Add the condensed milk, evaporated milk, orange zest and liquor, then whisk to blend. Pour into the pie dish or ramekins. Place the pie dish or ramekins in a larger pan and add hot water so it comes halfway up the sides of the ramekin or dish. This helps prevent over-baking. Place the water bath and flan into the oven. Bake for 20-25 minutes for individual ramekins or 50 minutes to an hour for a pie dish. You want the flan to be set but still jiggle slightly. 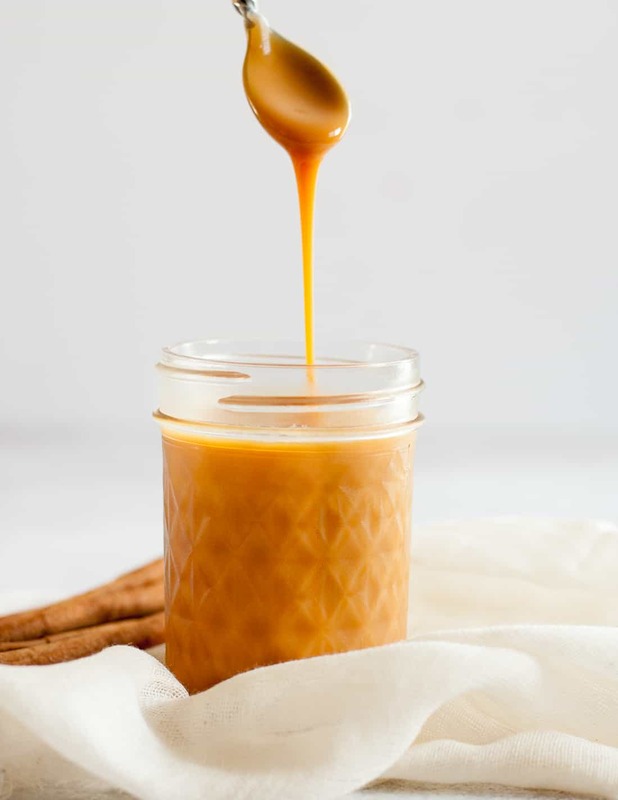 Remove the flan from the water bath and allow to cool on a wire rack for 30 minutes before refrigerating at least 2 hours, up to 2-3 days. When you are ready to serve, run a knife along the edge of the flan dish and invert directly onto your serving plate. Flan is very difficult to move once flipped! 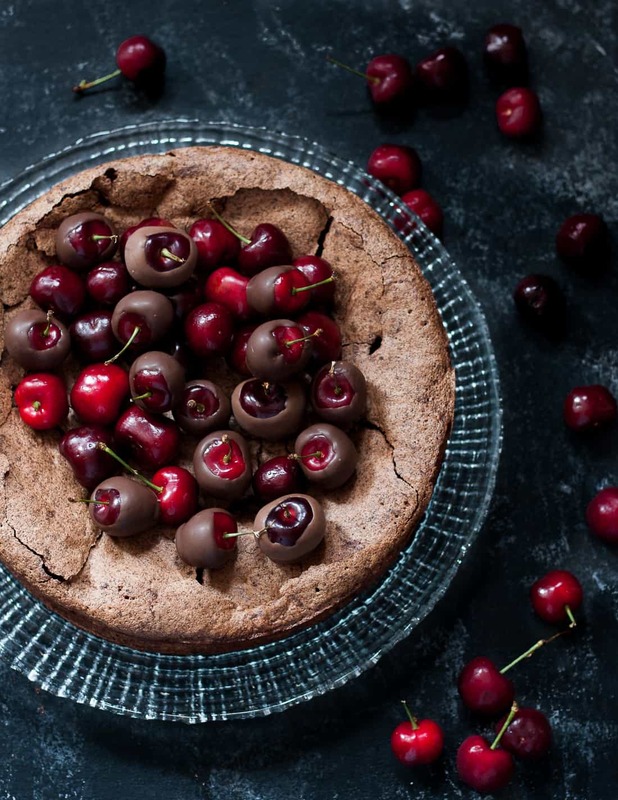 Lift away the baking dish and enjoy! Such a fun dessert! It looks delicious!